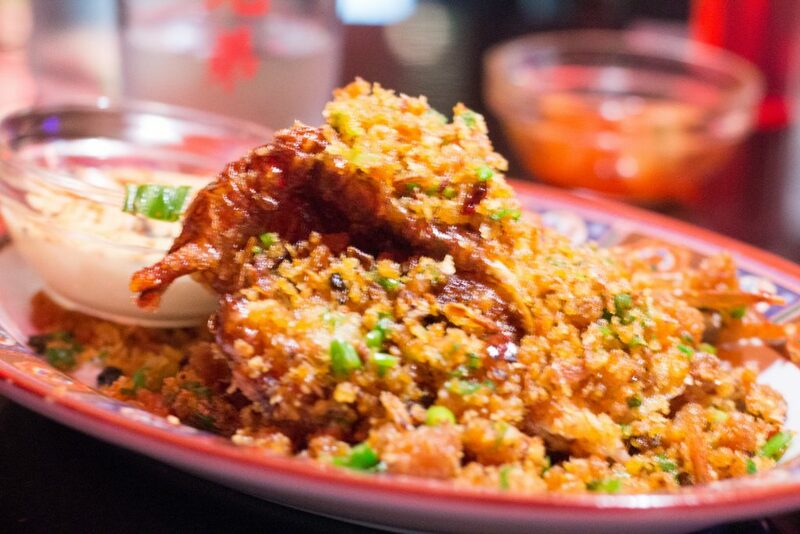 There’s a lot of hype lately about Camden’s street latest edition, Hang Dai Chinese. It’s a collaboration between chef Karl Whelan and Will Dempsey. Hang Dai serves Chinese dishes in a unique setting as it’s designed to look like a subway carriage which gives it a bit an edge. It’s dark lighting and DJ decks remind me of a mixture between 777 and Soder & Ko with a bit of Fade Street Social thrown in as well. Admittingly, I’m not a huge fan of restaurants with really loud music but this wasn’t the case with Hang Dai. However, we were there at 6pm on a Wednesday, it might be louder on the weekend. We had a few issues trying to book a table. Ok, a few issues is an understatement. The booking system is absolute pants. Trying to use it made me question my career as a software engineer. I couldn’t figure the thing out at all. Either they are completely booked out or else it’s just not working correctly. But anyway, we rang and got a booking over the phone. As I said, we went on a Wednesday evening. There wasn’t an empty seat in the house (so maybe their booking system isn’t broken and they genuinely are completely booked out) and the placed seemed to be buzzing. Their signature dish is Skeaghanore Duck which needs to be pre-ordered when booking and is cooked on the wood fired roasted oven for 50 minutes before being ready to serve. They recommend the 1/2 duck between two people (40e) but it also comes as a whole duck (80e). The duck is served 3 ways. 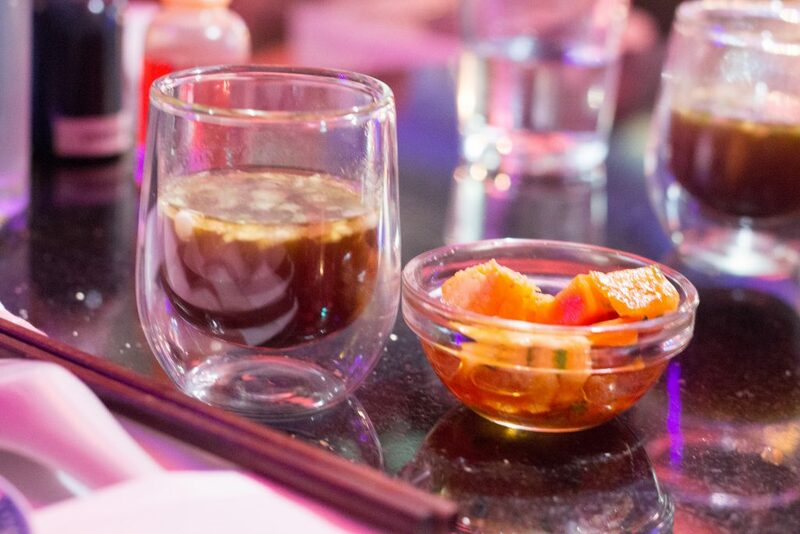 The first dish is a duck broth served with Chinese pickles. I’m not usually mad about broth’s, I find them a bit bland and boring but this one was packed full of flavour and the accompanying pickles added a nice spice to it. 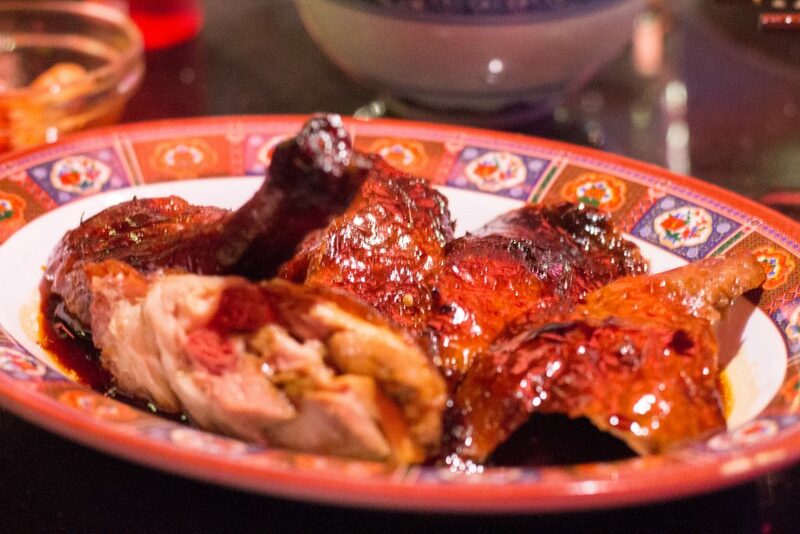 The second dish was Roast Duck Leg Chopped on the Bone and Drenched in Cantonese Style Soy Sauce and Duck Juices. The duck, the sauce, everything about this dish was gorgeous and there was plenty in it for two people. The third dish was Bejing Style Thinly Sliced Duck with Crisp Skin, served with Pancakes, Cucumber & Cherry Hoi Sin. Now, you know when you get duck pancakes from your local Chinese and the duck is a bit stringy and dry? Well, this dish was the complete opposite. There was a very generous portion of duck and each piece of it was thick and moist. The hoi sin sauce was to die for and the pancakes (which we needed more of) were soft and warm. I was torn between the scallop ceviche and the soft shell crab. In the end, the Typhoon Shelter Soft Shell Crab with Lemon Mayo (14e) won. As far as soft shell crab goes, this was one of the best I’ve had. TBH, I’m not sure how you’re supposed to eat this so I just ate it with my hands. I would order this again as a shared dish and get another one of the sharing dishes if I was going back. Niamh went for the Pork Dumplings Sweet Soy (11e). The dumplings were slightly unusual as they had sesame seeds on the outside. I’m kinda meh about dumplings, I can give or take them. These were lovely, though, there was a decent sized portion and Niamh enjoyed them as well. They don’t have any desserts on the menu. I’m not sure if they’ll be adding them to the menu or not but last night they weren’t needed anyway. The service was great. The staff were friendly and very informative and even gave me helpful tips about taking photos in the dark. The damage for the night was roughly 75e including two glasses of wine which is maybe a bit on the high side (says your one who forked out 300e for a meal for one 2 weeks ago) but not so expensive that I’m horrified by it. Would I go back to Hang Dai? Yes. I love Chinese food and the duck was probably the best duck I’ve had from a Chinese. 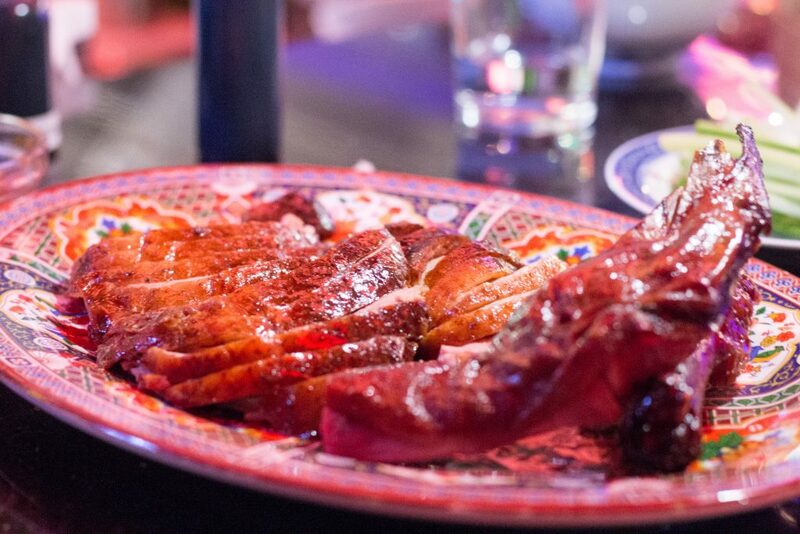 If duck is your thing, you should definitely try it out. What did I not like? Mentioned already, the booking system is terrible.